There are many possible injuries and conditions that you can experience in your lower limbs, but not all are equally as likely. At Dallas Podiatry Works, we certainly can provide treatment for rare conditions (like Buerger’s or Kohler’s diseases), but we also see a fair amount of common injuries like ankle sprains. No matter what the source is for your foot pain or discomfort, be sure to connect with our office to find out how we can help. Recognizing the symptoms of any injury is important, but there are two reasons it can be especially important for a sprain. The first is to distinguish the difference between a sprain and fracture. These two injuries are different, but there is a certain degree of overlap with regard to symptoms. Both can lead to pain, bruising, and swelling, so it is a smart move to have our doctors at either our Plano or Dallas, TX offices provide a professional diagnosis for you. The other key reason for recognizing an ankle sprain is to receive the proper treatment to avoid a long-term issue. When the ligaments do not heal completely before intense physical activity is resumed, ankle instability can become an issue. An unstable joint is subject to increased risk of future injury, which is why you need to recognize the injury and then following a proper treatment plan. Grade 1: This type generally entails a certain degree of overstretching and possibly tiny tears in the affected ligament. Symptoms usually include some tenderness and swelling around the injured joint. Grade 2: A moderate injury will frequently involve a partial tear in one of the ligaments. The resulting pain and swelling are of greater intensity, and there can be some looseness of the joint when it is moved in certain ways. Grade 3: In this instance, the ligament has completely torn and causes significant pain and swelling around the ankle. Joint instability becomes a major concern at this point. Protect. The first step is simply to protect the injured area. Some people may implore you to “walk it off” or claim that it is not a big deal, but you will risk further injury by not removing yourself from the game or activity where the sprain occurred. Rest. The human body is rather adept at healing itself, but the natural healing processes take some time. While your body is mending the affected tissues, it is important that you do not perform high impact activities or further stress the area. Our doctors can provide recommendations for low-impact activities that will allow you to maintain physical conditioning. Ice. During your downtime, be sure to use an icing regimen to reduce levels of pain and inflammation. Contact our office for information on appropriate time intervals and recommended practices. Compress. Compression is an important part of self-care because it helps to control swelling and inflammation levels in the injured area. An elastic bandage will work quite well. Elevate. In addition to applying compression, elevating the leg above heart level is useful for managing the condition. Additional treatment options that might be used will depend on the severity of the injury, along with the patient and his or her goals. 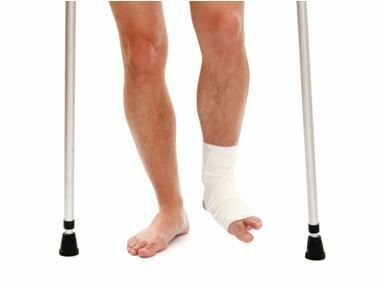 These can include medication, physical therapy, and equipment like crutches, braces, or boots to immobilize the ankle and allow for optimal healing. In severe cases, surgery might be recommended. There are a variety of factors that need to be considered at this point, though (your age and lifestyle, for example). We will let you know everything entailed with this option so you can make an informed decision. As noted, always be sure to contact us when you experience ankle pain. Our medical staff will properly diagnose the condition and then provide the treatment you need. Contact us for more information by calling our Dallas office at (972) 566-7474, or our Plano, TX office at (972) 943-3323, or request your appointment at either location online today.